This entry was posted in and tagged Trophy, cricket, Royal London One-Day Cup 2016 on August 2, 2016 by admin. As proud sponsors of Northampton Saints, The Big Trophy Shop is advertised through Elonex on their digital display boards at Franklin Gardens. Our advert appears periodically through the game beneath the scoreboard and without doubt is seen by the many thousands of spectators at each fixture. Elonex provide a very similar package at Worcester Cricket ground and invited us to attend the Royal London One-Day Cup 2016 fixtures between Northamptonshire and Worcestershire at New Road. 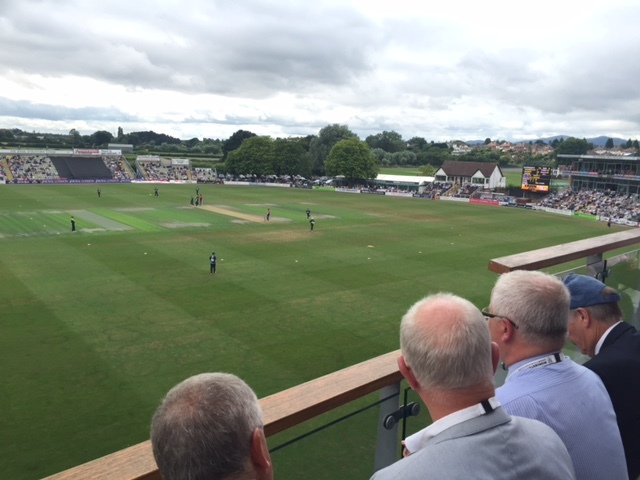 The game was a fifty over match and provided some dynamic batting and bowling which we were able to enjoy from the Executive Lounge. Happily Northampton won by 23 runs! Spending several hours in the company of fellow business people and cricket enthusiasts allowed for plenty of discussion around the subject of business, sport and of course trophies and awards. 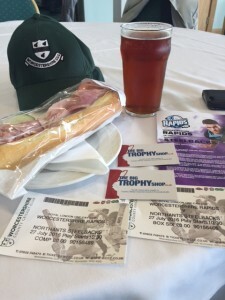 The Big Trophy Shop manages the annual trophy engraving for numerous Northamptonshire Cricket Clubs and sell thousands of small Cricket trophies, medals and gift items every year.